Dubai Central Laboratory (DCL) organized its first talent exhibition recently. 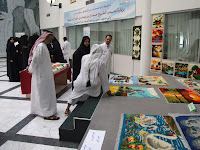 A number of employees from the Department participated in the two-day exhibition with various products that they made artistically. They included a variety of products of food, decoration, perfumes, accessories and clothing. Eng. Hawa Bastaki, Director of Dubai Central Laboratory Department, who expressed her happiness on finding a number of talented staff with creative abilities in various fields, encouraged them for nurturing their talents and organizing the exhibition for showing them to others. She said that such exhibitions of talented people are a vital means to promote bilateral friendship and direct communication among the employees. "It is also a way to strengthen social relationships and it will pave way for strengthening the working relationships between officials and the employees," said Bastaki. She also pointed out that the exhibition will be included in the Calendar of Events of the Department as a semi-annual programme as desired by the rest of the staff due to the tremendous response the exhibition witnessed. Bastaki said the activity also has another aspect of achieving a positive financial gain from the sale of products and displays that have attracted high demand from all.